Investigating and prosecuting the crime are the two key stages in the criminal justice process, which may take a number of years to complete. It is important to have an understanding of how the investigation and prosecution process works and to be able to access information and support when you need it. 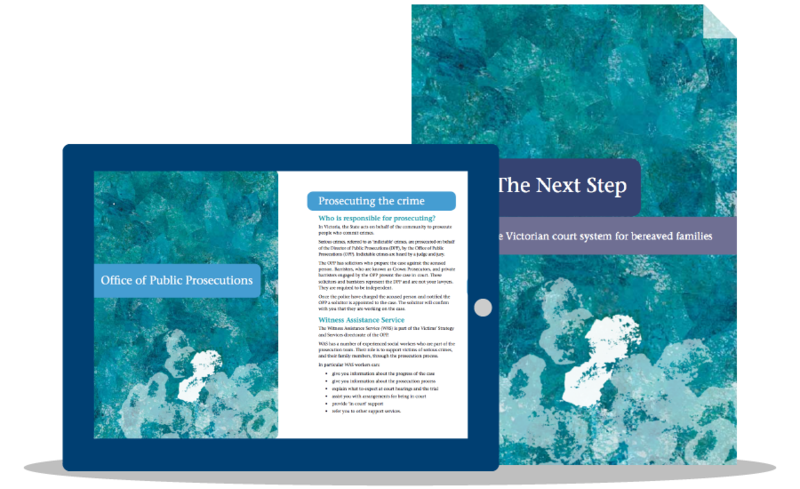 Taking The Next Step: A guide to the Victorian court system for bereaved families is a booklet produced by the Office of Public Prosecutions specifically for people who have lost loved ones to violent crime. It provides a step-by-step guide to the investigation and court process. It also provides contact details for relevant support and criminal justice agencies and explains how and where to access additional information and support.